"An Old Dress" / June 7, 2015 by Brian D.
Like most great ideas, the first place that Tabitha mentioned her desire to take pictures in her late Grandmother's heirloom dress was in a bar... after a few adult beverages. Uhm... Yes Please! Something about a story behind the images always draws me in. Tabitha was almost in tears describing the importance of this dress- tears of raw emotion. For me, this is exactly what contributes to great photography-- And I was all but jumping up and down. Fast forward 2 weeks. It was a beautiful (and HOT) June day in Alabama... lucky for us, there was an (uncharacteristic) cool breeze blowing through the trees every few minutes to remind us that patience makes perfect... A little gift from Tabitha's grandmother maybe? I like to think yes. And then the pure adoration and love between her and Clayton sealed the deal. If you study the images closely, you can truly feel the gentleness coming from Clayton as he supports his love on this emotional journey to honor someone special. While photography only captures a moment in time, I will forever remember this entire interaction with fondness. 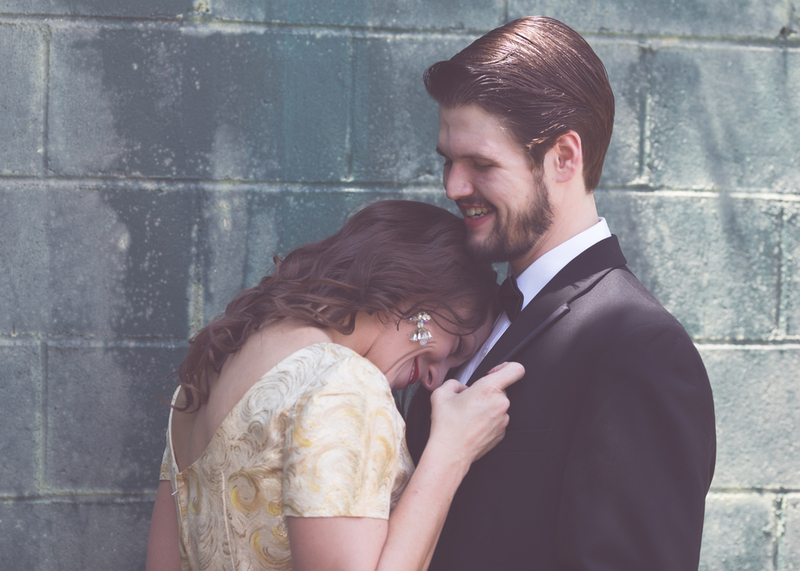 Style: The theme was an editorial styled shoot with a focus on telling a story about the timeless beauty of the 50 year old dress and the fresh new love between Tabitha and Clayton. Hair and makeup was done at Seville Salon. Location and Equipment: The shoot took place in area around the 160-acre Cloverdale Historic District in Montgomery Alabama along S Hull St, Cloverdale Rd, and Norman Bridge Rd. All shots were shot with natural light with the occasional use of a light diffuser. The Canon 6D was my primary camera shot in manual mode with the Canon 135mm F/2.0 and 24-70mm F/2.8 lenses.